Drones, also known as unmanned aerial vehicles, are aircrafts that do not need a human pilot on board. Drones are vital components of unmanned aircraft systems; these systems include ground-based controllers, UAVs along with a communication system between the two. Drone flights can operate with different degrees of autonomy. They can be operated by a human using a remote control or autonomously using an onboard computer. Unlike manned aircrafts, the military initially used drones for missions that were considered too dangerous or dull for humans. Although they were originally intended for military applications, the use of drones has rapidly expanded to scientific, commercial, recreational and agricultural applications, among others. This weekend you can find great drone deals by shopping Black Friday and Cyber Monday. Check out our friends over at Dronethusiast and their Cyber Monday drone deals post! Examples of uses include peacekeeping, policing, surveillance, aerial photography, product deliveries, and drone racing. At present, civilian drones have vastly outnumbered military drones, with estimated sales of more than one million by 2015. Drones, particularly the battery-powered ones have gained immense popularity in the recent past. There are several reasons for this increase in popularity. Firstly, a drone can continue to fly until it runs out of juice. Many manufacturers have made these unmanned aircrafts very easy to operate; as a result, they do not require a lot of piloting skill. If you are new to drones, you can take your quadcopter out of its package, charge the batteries and launch the device into the sky, without even reading the instruction manual. Nowadays, plenty of professional-grade drones are quite smart and can reduce the chances of making inadvertent interference with air traffic. They feature computer modules containing geofencing algorithms designed to keep the drones from flying too close or too high of a nearby airport. The algorithms also help keep the drone within the operator’s line of sight at all times. As drones communicate through smart-phone apps, they can access safe-flight instructions online. These instructions take into consideration the altitude and GPS location of the drone. Another reason for their popularity is the effective and fun use of cameras. A majority of drones feature high-definition cameras which can capture video as well. The videos and images captured by these devices have made them viral, catapulting them into the top positions on many peoples’ wish lists. UAV or drone innovations began in the 1900s and mainly concentrated on providing effective practice targets for training military personnel. The development of drones carried on during World War I, with the Dayton-Wright Company inventing pilotless torpedoes designed to explode at preset times. In 1916, the first attempt at a power-driven drone was by AM Low when he developed the Aerial Target. Some advances came after the World War I, which include the automatic plane developed by Hewitt Sperry. In 1935, model-airplane enthusiast and film star Reginald Denny developed the first version of the scaled remote pilot vehicle. More drones emerged, especially during the World War II to fly assault missions and train anti-aircraft gunners. Nazi Germany also developed and deployed a variety of UAVs during the war. In 1955, companies such as Beechcraft provided their unique Model 1001 for the use of US Navy. With the miniaturization and maturity of various applicable technologies, especially in the late 1980s and early 1990s, U.S. military started taking more interest in drone technology. In the late 1990s, the Department of Defense offered contracts to AAI Corporation. The US Navy purchased the AAI Pioneer drone that was developed jointly by AAI and Malat (an Israeli company). A lot of these aircrafts took part in the Gulf War in 1991. Drones are part of both cinematography and sports photography. In 2014, drones were used in Sochi in the Winter Olympics for filming snowboarding and skiing events. Journalists are also considering the use of drones as they can gather information and footage that you can use for a live broadcast. Farmers can use drones in a variety of ways for their benefit. Many people in the drone industry are of the view that agriculture represents a great opportunity for UAV technology. Drones can help save farmers plenty of money by timely identifying failing plants as well as take stock of crops. Also, farmers can use the device to study and map the farmlands and their irrigation system. In these situations, using drones can help expedite the time-consuming process. Moreover, you can equip drones to spray water and pesticides on crops. Farms with livestock can benefit from drones as they can be utilized to monitor animals and swiftly collect and track data regarding animal health. Construction contractors and architectural firms are deriving great benefits from drone technology. Similar to real estate professionals, architects can use footage and images of properties to develop 3D renderings of the buildings and structures they plan to build. Architects can quickly and cheaply create aerial shots to place their architectural renderings, which can help them develop real-world concepts of the projects. This unique ability is indispensable when it comes to developing accurate designs and models and understanding precisely how they can fit within relevant properties. During a construction project, getting access to these architectural plans is very useful to individuals responsible for the designing of the project. The increasing availability of dependable and off-the-shelf drones has eased routine aerial surveillance, which used to be arduous in the past. Although most drones are not specifically for conservation projects, many researchers are resorting to a couple of modification techniques to prepare drones better to keep track of wildlife, especially in harsh and severe environments. For example, drones equipped with multi-spectral cameras can see across a much broader range of electromagnetic spectrum, which makes it possible to analyze both animal life and different types of vegetation. Drones are discrete which allows them to monitor wildlife populations without alarming or disturbing them. This kind of monitoring effort can offer valuable insights into migration tracking, conservation efforts, and habitat management. It is also helpful in flood assessment, which tends to be especially useful in the coastal areas. Drones can provide information on rare animal populations, as the technology can identify animal species in places that are hard to access. After a human-made or natural disaster, drones can provide a quick and easy way to collect information and thoroughly navigate debris using useful and portable technology that will not drown out any cries for assistance. Rescue teams in the area can easily deploy the technology to expedite their efforts. As they feature radars and high-definition cameras, drones can easily provide rescue teams access to a wider and better field of view without having to waste resources on several manned helicopters. Also, due to their small and compact size, drones can offer a close view of regions where large aerial vehicles are likely to prove inefficient or perilous. Drones can also offer quicker access to top-notch and real-time visual inspections for different kinds of utility and energy companies who are required to inspect gas and oil pipelines, power lines, transmission towers, bridges, buildings and wind turbines. They allow the inspecting team or officers easy access to the relevant information from a distant and safe position. Moreover, inspections of complex infrastructures can benefit greatly from standard aerial monitoring. The unique ability to see things in three dimensions, detect metal strain and take thermal readings can considerably enhance the quality of infrastructure inspections. Small drones, in particular, can get close and hover over objects to provide a greater level of detail which can improve performance. As they feature various thermal sensors, drones can discover the whereabouts of lost or stranded individuals swiftly. These devices are especially useful in challenging terrains or during nighttimes. Especially in harsh conditions, many search and rescue missions are a tough battle against time. However, in these situations, drones can become your powerful tool as they are easy to deploy. Apart from locating victims, you can use drones to drop supplies to a remote or otherwise unreachable location. For instance, you can use a drone to lower a GPS locator, walkie-talkie, medical supplies or water and food to stranded victims before rescue teams can extract them. Drones come in a variety of shapes and sizes with many different features. Depending on the applications or needs, they have various sizes and designs. We will discuss the different types of drones according to their size, number of propellers, range, and equipment they carry. There are four main types of drone sizes. These drones in this category feature a size that commonly ranges from a few centimeters to 50 cm in length. These drones are very popular and are widely used because of their light weight and tiny structure and can work as spying weapons. They usually comprise of plastic and feature LED lights, accelerometers and radio receivers. They are ideal for people who are getting started with drones. Mini drones are a bit larger than nano drones, meaning that they tend to exceed 50 cm in length, but do not go beyond two meters. A majority of mini-drone models are often designed and constructed with fixed wings while a few may feature rotary wings. Because of their tiny size, they usually lack power. Similar to nano drones, most mini-drones are lightweight and weigh about 50 grams to 100 grams, making them easy to maneuver. They also have adjustable gyro sensitivity and flight-control systems to ensure secure and stable flights. A majority of drones in this category are heavy units. However, they are smaller and lighter compared to aircrafts. Medium drones can easily carry weights up to 25 Kg with an average flying time of five to ten minutes. UK Watchkeeper is a popular design in this category. They have up to six main rotors, built-in gyro, 3D flight technology and altitude lock. They usually feature high-definition cameras, USB card readers and batteries of up to 1500mAh. The size of large drones is comparable to that of an aircraft. These drones are commonly part of military applications. These drones usually have a flying time of about 25 to 30 minutes. They feature high-definition cameras with video recording. Some of the more sophisticated models are wind-resistant and equipped with the most advanced six-axis gyro control systems and headless modes. We can classify drones according to the number of propellers. These drones have three powerful motors, four gyros, three controllers and a single servo. Each motor features at the end of each arm which also houses a location sensor. To lift the tricopter, you will have to initiate a movement using the throttle lever. These drones can stay stable on their path as they are equipped with the latest sensors and navigations systems and require no manual correction. Multi-rotor devices designed using four blades are known as quadcopters. You can control these devices with specifically designed and brushless DC motors. Two motors move in an anti-clockwise direction while the other two move in clockwise direction. Most quadcopters have lithium polymer batteries. Hexacopters can serve various purposes with their six-motor mechanism. Compared to quadcopters, this device can gain more lifting power and flying time. Their mechanism is designed to provide a very safe landing. Octocopters have eight motors that power the eight propellers. These drones have much higher flying capabilities and are quite stable too. You can easily capture a stable footage using an octocopter, even at higher altitudes. These devices are top-rated in professional photography. Now we will classify the drones according to their flying range. These drones are common in military applications. They can travel up to 150 Km with an average flight ranging from eight to twelve hours; this makes them useful for spy and reconnaissance applications. These drones are more powerful than short-range drones. They are also called high-speed drones and can cover at least 650 Km. Mid-range devices are used mostly for meteorological data collection and surveillance applications. Most shooting experts and camera lovers purchase drones featuring high-end cameras to capture shots in challenging terrains. These drones are also part of the film industry. You can buy them easily as they have a flexible price range and start from just $100. Nowadays, many action cameras feature drone-mounting capabilities. Gyroscope technology is undergoing major development to enhance the drone’s flight capabilities. The latest six-axis stabilization feature allows the device to stay steady in the air and deal with tricky movements at steep turns. The flight control mechanism helps users enjoy straightforward navigation options and capture footage in high quality. These drones are gaining immense popularity because they can capture location details on the move. They have a valuable feature that enables them to remember their last location. They are also very stable. The Federal Aviation Administration has enacted some rules and regulations for people who want to fly drones in the United States. Therefore, you should know your rights and responsibilities before flying your new gadget. Fly at or less than 400 feet. Keep the drone within your sight. Do not fly over sports events or stadiums. If you are aware of and follow all the rules, you will be able to derive more enjoyment from the device and keep yourself and others safe. You can get familiar with the process of flying a drone with our step-by-step guide. Carefully go through the instructions and do not overlook them, as they can come in handy in case of any issues. Charge your battery with a charger that came with the drone. ​Position your drone as specified in the manual and ensure your flying space is clear and free of any danger. You should be positioned behind the device before it takes off. ​Push down on the throttle and turn on the transmitter. Then connect the battery. Push the throttle upwards, and you will notice that your drone will begin to take off. In case it leans backward or forward, compensates the movement with the pitch command. To help your drone stay on the right course, try to imagine as if you are in the drone, irrespective of the number of times your drone may spin or turn. After it takes off, try to move your drone forward. Avoid using the yaw control in the beginning and focus on flying forward a couple of times. Get familiar with the speed of your drone. Then fly the drone to the right and left sides using the roll control while maintaining the orientation and altitude. Now rotate the drone a little bit using the left stick, leaving it in this position. Then use only the right stick to maneuver your drone backward and forward, while staying in the same position. Keep rotating the drone until it reaches 180 degrees. The drone will be in the opposite direction compared to the initial position. Always keep the drone close to yourself and know your drone limits. Know the range of your transmitter before flying the device; this is where the instructions manual is important. To land the drone push down the throttle stick and try to land the device in the same spot you took off. We have discussed what a drone is and why drones have gained so much popularity in last few years. We have briefly discussed the history of drones. We have looked at the different uses of drones such as aerial photography, wildlife tracking, agriculture, search, and rescue operations and safety inspections, etc. We have classified and discussed the different types of drones according to their size (nano and large), many propellers (tricopters and hexacopters ), flying range (short, mid and endurance range) and their equipment (GPS, cameras, and stabilizers). We have highlighted some legal issues regarding the use of drones and provided a guide on how to fly a drone. 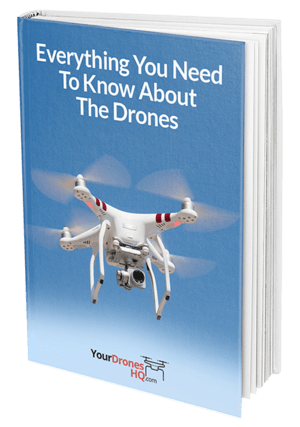 Our buying guide will discuss the different features that you should consider when buying a drone along with some recommendations.